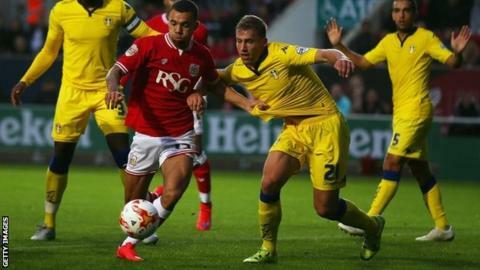 Bristol City scored two late goals to come from 2-0 down against Leeds United and earn their first point of the new Championship campaign. Leeds took the lead from Mirco Antenucci's penalty and their second came when Chris Wood cut inside and netted with a low finish. Kieran Agard pulled one back with two minutes left with a shot off the post. And, in the fifth minute of injury time, Aden Flint bundled the ball home from close range following a corner. City's late fightback leaves Leeds seeking their first victory of the season. The Robins, meanwhile, will hope to complete the £9m signing of Brentford striker Andre Gray after a night on which their forwards failed to capitalise on several decent chances. The hosts dominated the first half, with Jonathan Kodjia having one effort saved and also dragging a shot wide. Flint had a header cleared off the line by Stuart Dallas and the lively Joe Bryan shot straight at Marco Silvestri before Leeds took the lead from the penalty spot. Antenucci ran onto Wood's pass and drew a foul from Ben Hamer. The Italian smashed the subsequent penalty straight down the middle. Seven minutes after the break Leeds played on with Aaron Wilbraham down injured, and Antenucci caught City on the break before feeding Wood, who cut in and fired home. With two minutes remaining, substitute Agard netted a low strike from just outside the six-yard box after Bobby Reid's through-ball. And, after Leeds failed to clear a late corner, Flint was on hand to backheel home from close range. Bristol City manager Steve Cotterill: "I'm disappointed. We battered them tonight, we were excellent. For the penalty we made a mistake and the referee has made a mistake, he has not touched him. "The one thing our players have is fantastic spirit and we deservedly got something out of the game. "Our football tonight was fantastic and that is how we want to play. Once we rid ourselves of those errors we will be a force. There is nothing more to talk about on Andre Gray." Leeds manager Uwe Rosler: "I don't know where six minutes came from. Everyone in the stadium got very excited when they scored in the 88th minute. "The fans could not believe it when they saw six minutes. It was like a carnival, it gave them a boost. It was our third away game in six days. My boys gave it their all and we are disappointed we did not see it out. "We did our homework on Bristol City. It was an honest performance, nothing should take away from that. I'm very happy and very proud." Match ends, Bristol City 2, Leeds United 2. Second Half ends, Bristol City 2, Leeds United 2. Goal! Bristol City 2, Leeds United 2. Aden Flint (Bristol City) right footed shot from very close range to the bottom left corner following a corner. Attempt saved. Marlon Pack (Bristol City) header from the centre of the box is saved in the bottom left corner. Assisted by Bobby Reid with a cross. Corner, Bristol City. Conceded by Sol Bamba. Chris Wood (Leeds United) is shown the yellow card for a bad foul. Attempt blocked. Bobby Reid (Bristol City) right footed shot from the left side of the box is blocked. Attempt missed. Kieran Agard (Bristol City) header from a difficult angle on the right is close, but misses to the right. Assisted by Wes Burns with a cross. Offside, Bristol City. Bobby Reid tries a through ball, but Aaron Wilbraham is caught offside. Scott Wootton (Leeds United) is shown the yellow card. Goal! Bristol City 1, Leeds United 2. Kieran Agard (Bristol City) right footed shot from the centre of the box to the bottom right corner. Assisted by Bobby Reid with a through ball. Attempt missed. Chris Wood (Leeds United) right footed shot from the left side of the box is close, but misses to the right. Assisted by Charlie Taylor. Attempt saved. Aden Flint (Bristol City) left footed shot from the centre of the box is saved in the centre of the goal. Assisted by Marlon Pack with a cross. Substitution, Leeds United. Gaetano Berardi replaces Sam Byram. Bobby Reid (Bristol City) wins a free kick on the left wing. Corner, Bristol City. Conceded by Charlie Taylor. Delay in match Tom Adeyemi (Leeds United) because of an injury. Attempt missed. Bobby Reid (Bristol City) right footed shot from outside the box is high and wide to the right. Assisted by Korey Smith. Attempt missed. Marlon Pack (Bristol City) right footed shot from outside the box is too high from a direct free kick.